Usually referred to as the flu or grippe, influenza is a highly infectious respiratory disease. Its name comes from the Italian word for “influence,” because people in eighteenth-century Europe thought that the disease was caused by the influence of bad weather. We now know that flu is caused by a virus. When the influenza virus is inhaled, it attacks cells in the upper respiratory tract, causing such typical flu symptoms as fatigue, fever and chills, a hacking cough, and body aches. Although the stomach or intestinal “flu” is commonly blamed for stomach upsets and diarrhea, the influenza virus affects humans less often than is commonly believed. Influenza is considerably more debilitating than the common cold. 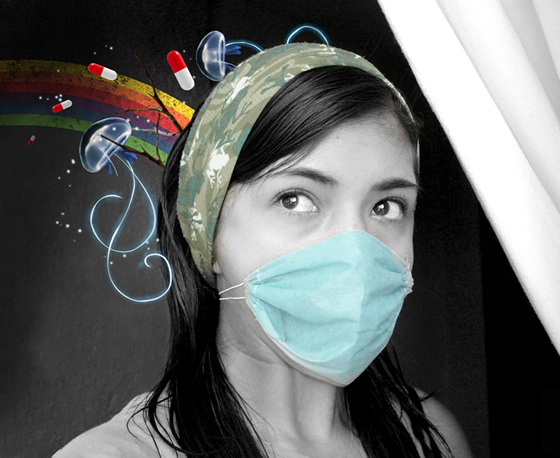 Influenza outbreaks occur suddenly, and infection spreads rapidly. The annual death toll attributable to influenza and its complications averages 20,000 in the United States alone. In the 1918-1919 Spanish flu pandemic, the death toll reached a staggering 20–40 million worldwide. Approximately 500,000 of these fatalities occurred in North America. 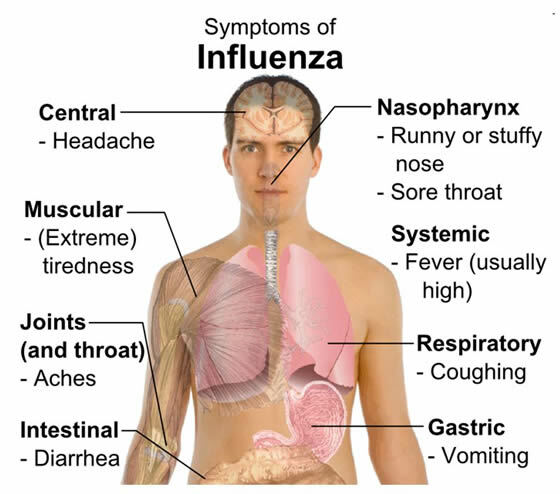 Influenza outbreaks occur on a regular basis. The most serious outbreaks are pandemics, which affect millions of people worldwide and last for several months. The 1918-19 influenza outbreak serves as the primary example of an influenza pandemic. Pandemics also occurred in 1957 and 1968 with the Asian flu and Hong Kong flu, respectively. Epidemics are widespread regional outbreaks that occur every two to three years and affect 5–10% of the population. A regional epidemic is shorter lived than a pandemic, lasting only several weeks. Finally, there are smaller outbreaks each winter that are confined to specific locales. Approximately one to four days after infection with the influenza virus, the victim develops an array of symptoms. Symptoms are usually sudden, although the sequence can be quite variable. They include the onset of headache, sore throat, dry cough, and chills, nasal congestion, fatigue, malaise, overall achiness and a fever that may run as high as 104°F (40°C). 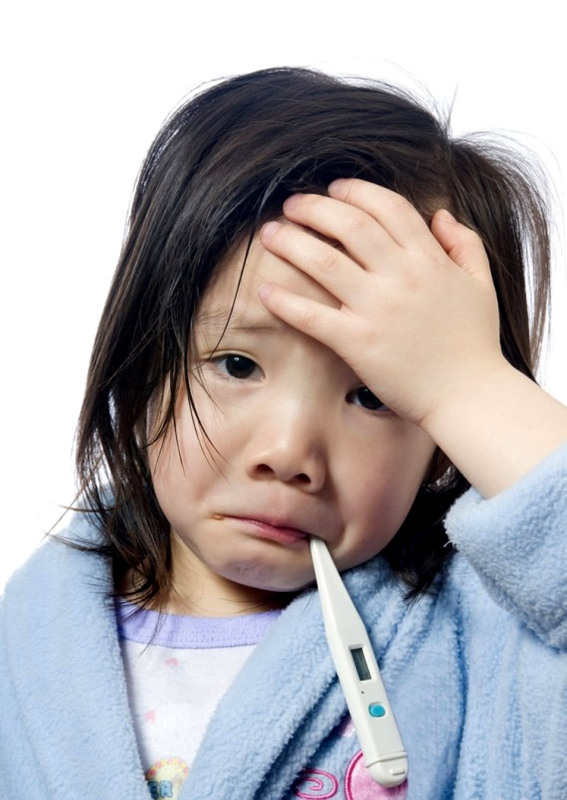 Flu victims feel extremely tired and weak, and may not return to their normal energy levels for several days or weeks. Influenza complications usually arise from bacterial infections of the lower respiratory tract. Signs of a secondary respiratory infection often appear just as the patient seems to be recovering. These signs include high fever, intense chills, chest pains associated with breathing, and a productive cough or sinus discharge with thick yellowish-green sputum. If these symptoms appear, medical treatment is often necessary. Other secondary infections, such as sinus or ear infections, may also require medical intervention. Heart and lung problems and other chronic diseases, can be aggravated by influenza, which is a particular concern with elderly patients. With children and teenagers, it is advisable to be alert for symptoms of Reye’s syndrome, a rare but serious complication that occurs when children are given aspirin. Symptoms of Reye’s syndrome are nausea and vomiting, and more seriously, such neurological problems as confusion or delirium. The syndrome is primarily associated with the use of aspirin to relieve flu symptoms in children. Although there are specific laboratory tests to identify the flu virus strain from respiratory samples, doctors typically rely on a set of symptoms and the presence of influenza in the community for diagnosis. Specific tests are useful to determine the type of flu in the community, but they do little for individual treatment. Doctors may administer such tests as throat or sinus cultures or blood tests to identify secondary infections. The patient should drink plenty of fluids and eat nutritious foods. Chicken soup with ginger, scallions, and rice noodles is nutritious and has healing powers. Rest, to allow the body to fight infection, is very important. Gargling with salt water (half teaspoon salt in one cup of water) helps to soothe a sore throat. A vaporizer with eucalyptus or Vicks VapoRub will make the patient feel more comfortable by easing breathing and aiding sleep. Applying Vicks ointment over chest and back will assist and speed recovery. Returning to normal activities too quickly invites a possible relapse or complications. Ginger (Zingiber officinalis) reduces fever and pain, has a sedative effect, settles the stomach, and suppresses cough. Forsythia (Forsythia suspensa) fruit can be taken as a tea for its anti-inflammatory, fever-reducing, and antimicrobial properties. Honeysuckle (Lonicera japonica) flower can be taken as a tea for its anti-inflammatory, fever-reducing, and antimicrobial properties. Anise seed (Pimpinella anisum) can be added to tea to expel phlegm, induce sweating, ease nausea, and ease stomach gas. Slippery elm (Ulmus rubra) can be taken as a tea or slurry to soothe sore throat and ease cough. Echinacea (Echinacea purpurea or angustifolia), in clinical studies, reduced flu symptoms including sore throat, chills, sweating, fatigue, weakness, body aches, and headaches. The usual dosage is 500 mg thrice on the first day, then 250 mg four times daily thereafter. Goldenseal (Hydrastis canadensis) has fever reducing, antibacterial, anti-inflammatory, and antitussive properties. The usual dose is 125 mg three to four times daily. Goldenseal shouldn’t be taken for more than one week. Astragalus (Astragalus membranaceus) boosts the immune system and improves the body’s response to stress. The common dose is 250 mg of extract four times daily. Cordyceps (Cordyceps sinensis) modulates and boosts the immune system and improves respiration. The usual dose is 500 mg two to three times daily. Elder (Sambucus nigra) has antiviral activity, increases sweating, decreases inflammation, and decreases nasal discharge. In a study, elderberry extract reduced flu symptoms within two days whereas placebo took six days. The usual dose is 500 mg of extract thrice daily. Also use 2 tsp of dried flowers in 1 cup of water as a tea. Schisandra (Schisandra chinensis) helps the body fight disease and increases endurance. Eucalyptus (Eucalyptus globulus) or peppermint (Mentha piperita) essential oils added to a steam vaporizer may help clear chest and nasal congestion. Boneset infusion (Eupatorium perfoliatum) relieves aches and fever. Yarrow (Achillea millefolium) relieves chills. Acupuncture and acupressure are said to stimulate natural resistance, relieve nasal congestion and headaches, fight fever, and calm coughs, depending on the points used. A homeopathic remedy called Oscillococcinum may be taken at the first sign of flu symptoms and repeated for a day or two. This remedy is said to shorten the duration of flu by one or two days. Although oscillococcinum is a popular flu remedy in Europe, however, a research study published in 2003 found it to be ineffective. Other homeopathic remedies recommended vary according to the specific flu symptoms present. Gelsemium (Gelsemium sempervirens) is recommended to combat weakness accompanied by chills, a headache, and nasal congestion. Bryonia (Bryonia alba) may be used to treat muscle aches, headaches, and a dry cough. For restlessness, chills, hoarseness, and achy joints, poison ivy (Rhus toxicodendron) is recommended. Finally, for achiness and a dry cough or chills, Eupatorium perfoliatum is suggested. Hydrotherapy can be utilized. A bath to induce a fever will speed recovery from the flu. While supervised, the patient should take a bath as hot as he/she can tolerate and remain in the bath for 20–30 minutes. While in the bath, the patient drinks a cup of yarrow or elderflower tea to induce sweating. During the bath, a cold cloth is held on the forehead or at the nape of the neck to keep the temperature down. The patient is assisted when getting out of the bath (he/she may feel weak or dizzy) and then gets into bed and covers up with layers of blankets to induce more sweating. Supplemental vitamins are recommended for treating influenza, and include 500–2000 mg vitamin C, 400 IU to 500 IU of vitamin E, 200 micrograms to 300 micrograms selenium, and 25,000 IU beta-carotene. Zinc lozenges are helpful, as is supplemental zinc at 25 mg per day for two weeks or more. Traditional Chinese medicine (TCM) uses mixtures of herbs to prevent flu as well as to relieve symptoms once a person has fallen ill. There are several different recipes for these remedies, but most contain ginger and Japanese honeysuckle in addition to other ingredients. Because influenza is a viral infection, antibiotics are useless in treating it. However, antibiotics are frequently used to treat secondary infections. Over-the-counter medications are used to treat flu symptoms. Any medication that is designed to relieve such symptoms as pain and coughing will provide some relief. The best medicine for symptoms is an analgesic, such as aspirin, acetaminophen, or naproxen. Without a doctor’s approval, aspirin is generally not recommended for people under 18 owing to its association with Reye’s syndrome, a rare aspirin-associated complication seen in children recovering from viral infections. Children should receive acetaminophen or ibuprofen to treat their symptoms. There are four antiviral drugs marketed for treating influenza as of 2003. To be effective, treatment should begin no later than two days after symptoms appear. Antivirals may be useful in treating patients who have weakened immune systems or who are at risk for developing serious complications. They include amantadine (Symmetrel, Symadine) and rimantadine (Flumandine), which work against Type A influenza; and zanamavir (Relenza) and oseltamavir phosphate (Tamiflu), which work against both Types A and B influenza. Amantadine and rimantadine can cause such side effects as nervousness, anxiety, lightheadedness, and nausea. Severe side effects include seizures, delirium, and hallucination, but are rare and are nearly always limited to people who have kidney problems, seizure disorders, or psychiatric disorders. The new drugs zanamavir and oseltamavir phosphate have few side effects but can cause dizziness, jitters, and insomnia. The Centers for Disease Control and Prevention recommend that people get an influenza vaccine injection each year before flu season starts. In the United States, flu season typically runs from late December to early March. Vaccines should be received two to six weeks prior to the onset of flu season to allow the body enough time to establish immunity. Each season’s flu vaccine contains three virus strains that are the most likely to be encountered in the coming flu season. The virus strains used to make the vaccine are inactivated and will not cause illness. When there is a good match between the anticipated flu strains and the strains used in the vaccine, the vaccine is 70-90% effective in people under 65. Because immune response diminishes somewhat with age, people over 65 may not receive the same level of protection from the vaccine, but even if they do contract the flu, the vaccine diminishes the severity and helps prevent complications. It should be noted that certain people should not receive an influenza vaccine. Infants six months and younger have immature immune systems and will not benefit from the vaccine. Because the vaccines are prepared using hen eggs, people who have severe allergies to eggs or other vaccine components should not receive the influenza vaccine. Some persons may receive a course of amantadine or rimantadine, which are 70-90% effective in preventing influenza. All people 65 years and older. Residents of nursing homes and chronic-care facilities. Adults and children who have chronic heart or lung problems. Adults and children who have chronic metabolic diseases, such as diabetes and renal dysfunction, as well as severe anemia or inherited hemoglobin disorders. Children and teenagers who are on long-term aspirin therapy. Anyone who is immunocompromised, including HIV-infected persons, cancer patients, organ transplant recipients, and patients receiving steroids, chemotherapy, or radiation therapy. Anyone in contact with the above groups, such as teachers, care givers, health-care personnel, and family members. Elderberry prevents influenza virus from infecting cells. Echinacea; at the first sign of malaise or infection, take 3–5 ml of tincture or 2 tablets three or four times daily for three to 10 days.